If you’re looking for some real scares this fall season, turn your attention away from schlocky horror flicks and consider trekking out to Tarragon Theatre. Theory is on until November 25, and it’s an absolute thrill that’ll keep you on the edge of your seat. Theory is an original play by writer Norman Yeung. It’s a sort of social justice thriller with some very relevant dialogue, but the overarching perspective is still quite sensitive and informed. Isabella (Sascha Cole) is a film professor trying to bring complex critical discourse into her class regardless of the controversy it causes. She sets up an online discussion board outside of the school’s website and insists on leaving every comment up, only for the discussion to turn problematic (racist, sexist, homophobic) and then violent. The tech and set for Theory are stunning and expertly interwoven. At the start of the show, they have a procedural-thriller-esque boom from a deep bass that you feel in your seats. From that point out, every aspect of the projection, by Cameron Davis, lighting, by Joe Pagnan, and sound, by John Gzowski, are tightly synced together. Tight is a good descriptor of this production as a whole, and that praise goes to director Esther Jun. Most times when seeing an opening night performance, there are tiny flubs that you spot but overlook. This performance was so well-refined and without any hiccups, that you’d think this has been running for months. Cole’s performance as Isabella is quite nuanced. At the outset, her stubbornness in the face of protest from her wife Lee (Audrey Dwyer) is almost annoying. As the play progresses, you feel for her situation regardless of that impression. Moreover, she really grows on you. Dwyer, as Lee, offers up a fantastic performance, her character is my favorite in the show, though I do wish she was given a bit more to do near the end. The rest of the supporting cast are all talented, and each of their characters serves an important role in offering a different perspective. 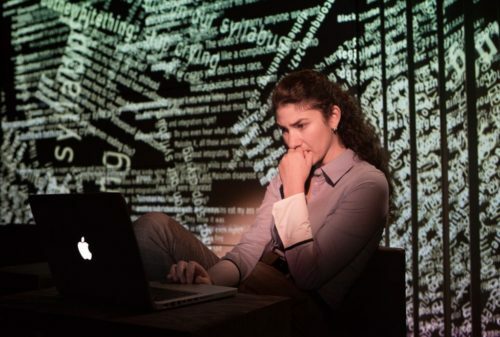 Theory punches up hard with its social commentary, but while all this is happening a tense thriller edges its way on to the stage and into the recesses of your mind. The ending isn’t quite as satisfying as I had hoped for, but I left the theatre feeling like I’d been through an absolute roller coaster of show. Moment to moment, the audience’s reactions are ever-shifting and visceral. We’d be laughing in one instance, only for the brevity to be punctuated by a shocking moment giving rise to gasps. And yes, the ending is a bit muddier than I’d hope for. The last scene is scary, but the way that the pieces fall into place as the play draws to a conclusion doesn’t give you the satisfaction you’d hope for from a thriller like this. Regardless, Theory is an absolute thrill. This is one of the most exciting shows on stage right now, and I highly recommend you check it out. Theory is playing at (30 Bridgman Ave.) until November 25, 2018. Showtimes are Wednesday to Saturday at 8:00 pm, with weekend matinees at 2:30 pm. Tickets can be purchased online or in person at the box office. Audience Advisory: Contains violence, coarse language, violent and pornographic imagery.